A SERIES OF very high tides are expected this weekend with sandbags and other flood prevention measures being put in place ahead of potential flooding. Flood defences that have been in place since the series of storms at the beginning of this month have stayed in position in anticipation of this weekend’s tides. 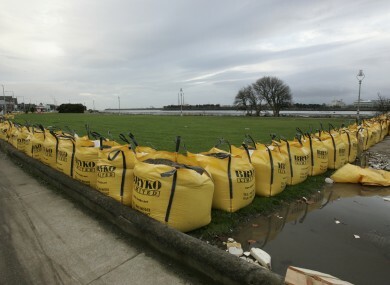 The one tonne sandbags that were put in place at Clontarf to deal with the January high tides remain in place and the River Tolka flood gates are being put in operation. The boardwalk along the Dublin city quays will be closed from tomorrow evening until at least Monday. The car parks along the promenades at Sandymount and at Clontarf will be closed and pedestrian access points sealed. There is also a possibility that Strand Road and Beach Road in Sandymount will be closed due to waves. Officials are are warning members of the public to stay away from sea walls and not go close to them to take photographs. Met Éireann have not yet warned of any potentially dangerous weather and other local councils haven’t issued any high tide warnings. Email “Better safe than sorry: Dublin flood defences in place ahead of 'very high tides'”. Feedback on “Better safe than sorry: Dublin flood defences in place ahead of 'very high tides'”.